Thursday March 25th at 7:00 p.m. The Fort Dix Five. Yassin Aref. The Newburgh Four. "Homegrown terrorists" stopped dead in their tracks, or victims of FBI entrapment? 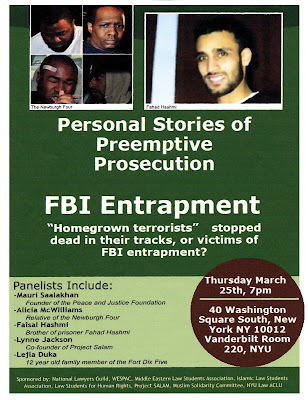 A panel of speakers will discuss these cases in light of the FBI's campaign since 9/11 that includes preemptive prosecution, the targeting of Muslim communities and the use of agent provocateurs and informants to entrap innocent people. El-Hajj Mauri Saalakhan, Director of Operations for The Peace and Justice Foundation - a Muslim led grassroots human rights organization based in Metropolitan Washington, DC, and lead convener for the May 6, 2010, mass mobilization for political prisoner, Dr. Aafia Siddiqui. Alicia Mc Williams, aunt of David Williams, one of the Newburgh Four, the men charged with the attempted bombing of the Riverdale Temple. Lejla Duka, 12 year old family member of Fort Dix Five. Lynne Jackson, a volunteer and one of the founders of Project Salam, an internet group that believes many innocent Muslims were targeted, prosecuted, and convicted in the hysteria following 9/11 and the Bush Administration's violations of the US Constitution. The organization's mission is to identify as many of these cases as possible, to advocate for their release, and to make sure that their names and the injustices against them are not forgotten. Other family members and lawyers from these entrapment cases will be present.